...about to cry really loudly. He was really beginning to do many things at this special time. He was beginning to hit his animals on his playmat, balancing his head more, and smiling at momma in the morning. He has grown so much. Our little guy turned 2 mths. on April 26, 2010. Momma and Daddy Love you! 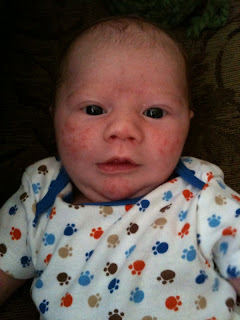 Our adorable little boy was one month old on, March 29th, 2010. He is laughing, smiling, kicking, holding his head up high, and can lift his shoulders up when he is on his stomach, along with his head. He did his first "push up" just a few days ago, while on his tummy. He is very strong and is losing his baby hair. We'll see if he's a true red head soon enough. Enjoy these little snap shots of our Kelton. Yes, that is baby acne you see on his face. 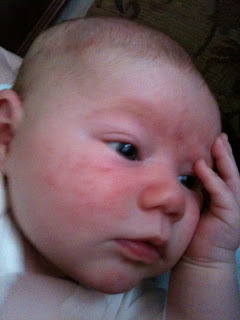 One of our friends' son from church, who is a sweet 8 year old boy, asked us if he had the chicken pox. I told him no, it was baby acne. He gave us a laugh. ANd he keeps on growing....more to follow soon. I know I'm a little behind, but hope to catch up soon.